Hey guys, Yesterday I did an interesting server configuration. Actually we had a rails app hosted on server which is using passenger(a.k.a mod_rails). This application can be access by going to http://domain.com . Also we had a wordpress running which could be access by going to http://blog.domain.com. The problem was if I configure wordpress for http://domain.com/blog and go to this url, the request was handled by rails app because of domain.com virtualhost. Also I created a symbolic link to wordpress installation directory under rails public folder(ln -s /var/www/html/wordpress /var/www/html/railsapp/public/blog). I restarted apache and it worked fine. WordPress was running at http://domain.com/blog and rails app was as http://domain.com/. 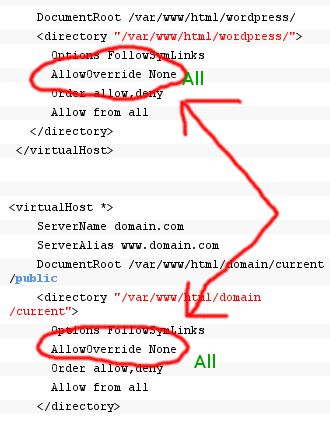 Update: If you want to change your wordpress permalink structure in account of SEO please change “AllowOverride None” to “AllowOverride All” as shown in image below. Thank you for this post. I am having one issue though. However, http://www.domain.com/blog/wp-admin works perfectly fine. Any ideas what could be wrong with the setup? Woh!! it helped me again while setting up rails and wordpress. Good, I wrote a blogpost earlier. Nice one, will give it a try. Humm, I followed the directions exactly and I am still getting a 404 when I go to mydomain/blog. Any idea what may be going awry? What version of Apache & passenger you are using? I am on Apache/2.2.14 (Ubuntu) and Passenger 2.2.15. I added the stuff but I still get a 404. I am however now clearly skirting passenger, as before the 404 page was the one served up by Rails and now it is the apache default. I think the paths are correct. Thanks for taking a look! But now I am still hitting the rails app when I go to a sub-page on the blog. Any post I try to look at takes me to the index of the Rails app. Thanks again for any wisdom you can drop on this problem.